The place is a picture of quaintness; of tea shops and coach tours and souvenirs. Scratch under the surface, however and another Widecombe is unravelled, steeped in history and a fair bit of mystery besides. You can take a turn around the churchyard and almost feel the weight of centuries unwind. And if you choose to look up at the height of the tor-capped hills their imposing presence can leave a lasting impression. The War Horse location scouts certainly thought so and Spielberg concurred. For our all-too-brief circuit of the village we set out unfashionably late, having stopped for a long overdue lunch. But on the plus side we had two additional pairs of eyes and another photographer in our midst. So when our merry band (Sherry, myself, Lady on the lead, Jane Redman and new member Majka) finally set out on foot, we were able to look and listen almost everywhere at once. Majka had never been to Widecombe before so we each took our turn in playing a tour guide, compelled to show her the essence of the village without leaving out any of the best bits. Inevitably, there were a few omissions as we had to squeeze in a walk as well. We began by taking the short footpath (due East of the village on the OS map) and heading roughly south-south-westerly across a damp meadow. At the far end we walked left along the lane and past The Rugglestone Inn. This is the sort of pub that serves local ales and oozes eccentric charm. If time permitted we would have stopped again but we had barely begun. There are plenty of places to sit outside in favourable conditions and watch the ducks waddling to and fro in the stream. 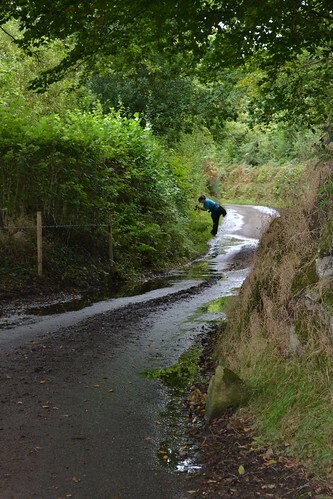 We followed the lane up the hill towards Venton. Because of the hour and the overcast light, photographing bugs and flowers in the hedgerows proved a real challenge. There were a few French Crane's-bills but their pinks proved less glorious than usual. And on auto, the high iso numbers rendered the background too grainy for our tastes. Better luck next time, perhaps. 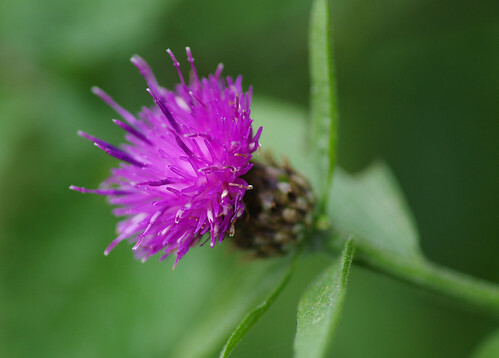 This knapweed came out more favourably. 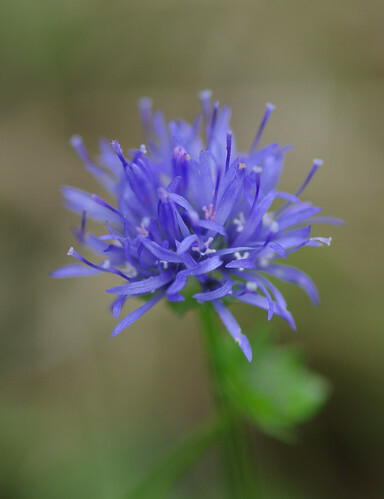 Sheep's-bit is locally common around the lanes bordering hamlets and meadows around Dartmoor. 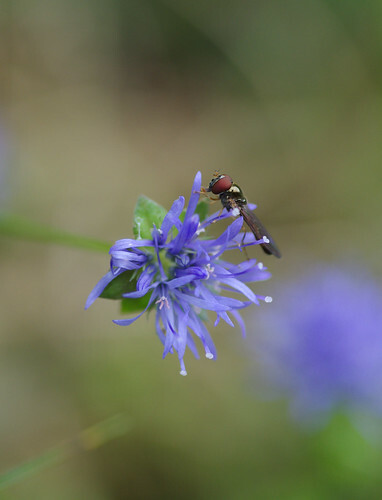 Sherry struck lucky when this fly shared her fascination. Initially we all thought this leaf might have had a disease (a sort of plant chicken-pox, if you will). 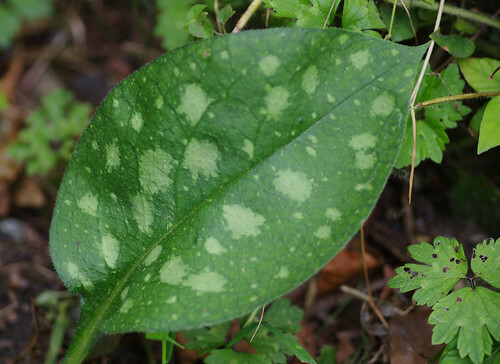 But closer inspection of the leaf and the customary perusal of the flower guide at home revealed the leaves of lungwort are supposed to look like this. We will have to keep a keen eye out for the plant during its flowering season next year. 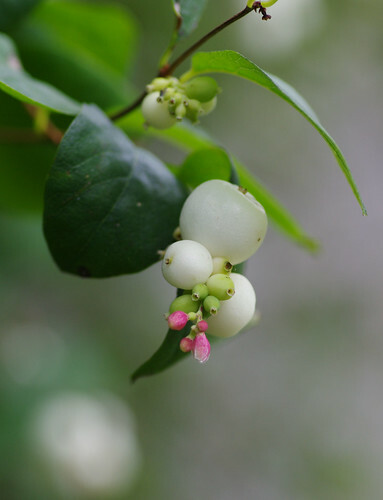 Snowberries are often planted in gardens for their ornamental quality. Sometimes, when you are walking along, everything becomes a blur. You are not sure where a garden ends and where a hedgerow begins. Everything can join into one and leave you none the wiser. This might not be a wild flower in the strictest sense. But I have included it here simply because I liked the picture. As a little girl, Sherry used to call the berries 'white pops' because they would pop if you trod on them. These examples were kept intact on the bush. At the next lane junction, we veered right along another lane. 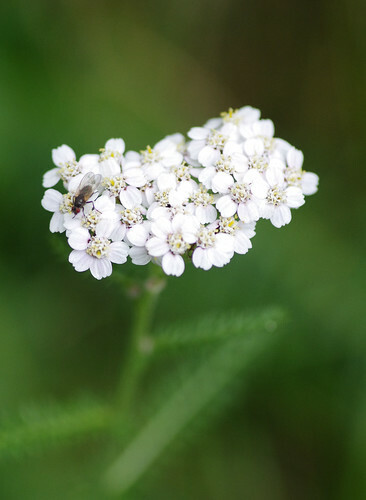 It was bordered by hedgerows and we found many familiar flowers, including this yarrow, with fly in attendance. There were water mints and redshanks and water-peppers drooping in a line. 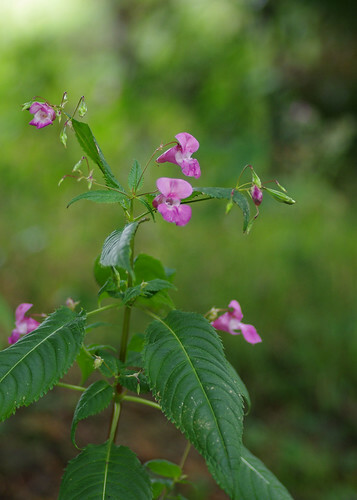 Balsam is a flower that we see often but doesn't always make the shortlist, as it were. It is invasive and has extended its range dramatically in recent years. 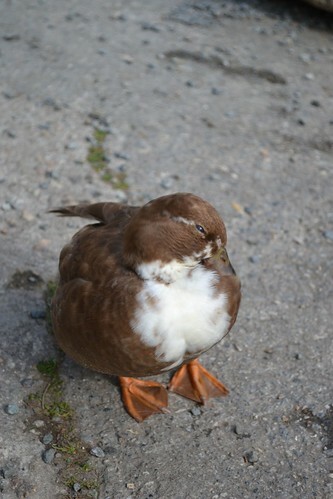 It spreads in damp places, particularly when in close proximity to water. Because these flowers spread so voraciously they can take over places where native plants once thrived, and by doing so place them under threat. In some areas, eradication programmes have been implemented by chemical treatment or burning to restore the balance of how things used to be. 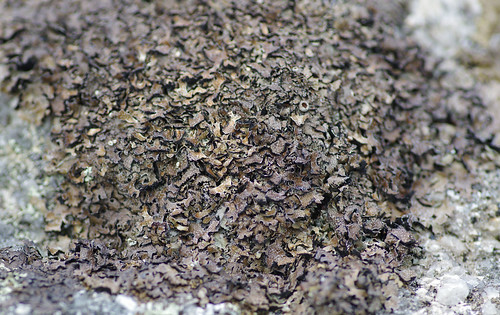 We found these dog lichens in several of the hedgerows and stone walls. They can vary markedly in colour and sometimes look like old crumpled pieces of paper. 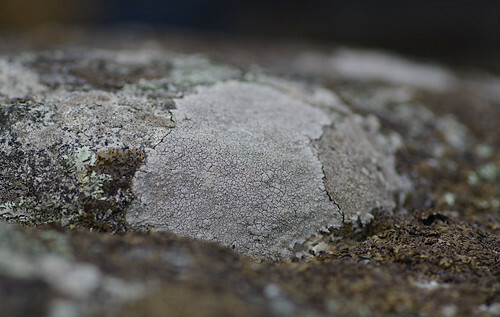 The surfaces of stone crosses (be it the plinths or the crosses themselves) are a haven for lichens. I had a whale of a time trying to find the species in the middle before I eventually accepted defeat. A hand lens is often needed for a definitve examination and I did not have one to hand on this occasion. 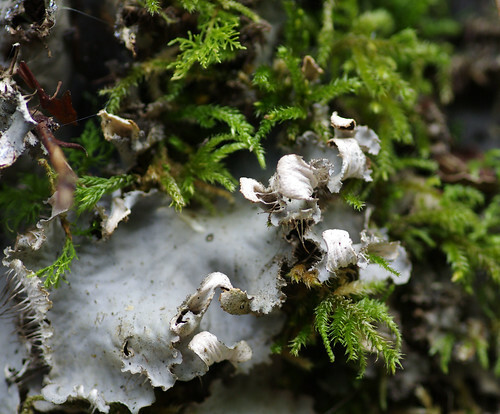 My search for the lichen above was more successful simply because it was more distinctive. At the top of the lane we turned right again and began the homeward leg of our stroll. 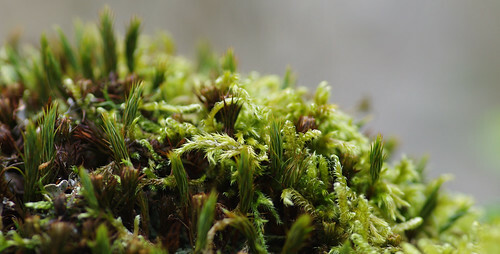 This jungle of mosses covered the stones on the wall of a hedgerow. Answers on a postcard will be gratefully received. Until then I will just admire this miniature forest from a safe distance. 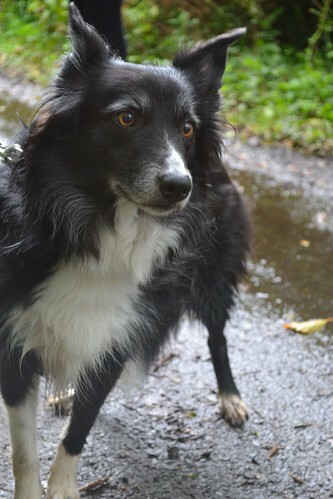 Suffice to say, Majka was not immune to the Lady's charms and found our constant collie companion as photogenic as Sherry does. At this stage, Lady and I were poised to continue but the pressing passage of time cut our walk abruptly short. Farewell Widecombe. I'm sure we will meet again soon.